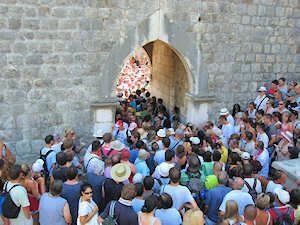 Crowds in Dubrovnik: Avoid them! 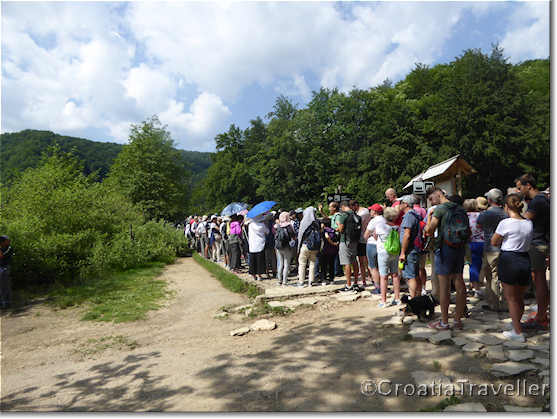 July and August in Croatia can be astonishingly crowded. Major hotspots such as Dubrovnik and Plitvice Lakes are relatively small yet thousands of visitors at a time try to appreciate their wondrous sights. The results are long lines to enter and elbow-to-elbow foot traffic once you do. Travelling by car in the summer also means heavy traffic on the roads and long, long waits to board a car ferry to the islands. Even foot passengers may find that the sailing of their choice to popular islands like Hvar and Korcula is completely booked. 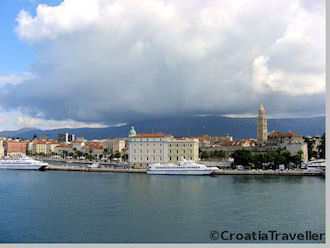 Most flights to Croatia run from May to October and Croatia ferries are just as frequent in June and September as well. Plus, the full weight of the summer heat has yet to descend. May and October are also fine months to visit Croatia. Of course, your schedule may only permit a visit in high season. In that case, you may find it less oppressive to make day trips from a large city such as Zagreb and Split where visitors are more dispersed. Consider exploring one of the less-visited islands such as Vis or Brac or venture up the coast to Dugi Otok, the Kvarner Gulf or beautiful Istria. Ferries, local flights and buses to and from popular destinations in the summer can fill up quickly. Even in June and September it's wise to book transport a month or so ahead of time if you need to be in a particular place at a particular time. Hotels can also fill up in the summer. There's now a glut of private accommodation but the most desirable and best-located rooms and apartments can also get snatched up early. Local ferries to and among the islands are not necessarily daily and vary by season. Do not assume that there "must be" a ferry from one place to another. Not necessarily. Inter-island ferries are limited, especially off-season. Read the schedules carefully and check with the ferry company if necessary. You'll find a list of the latest schedules and ferry companies here. Get your car to the ferry embarkation point at least two hours in advance even if you have a reservation. Jadrolinija, the only car ferry company, sells tickets not reservations. Your ticket is good for the entire day of travel, but does not guarantee a place on any particular sailing. It's wise to stop in a Jadrolinija office and ask how long in advance they recommend that you arrive for your particular sailing. Find out more about ferries . 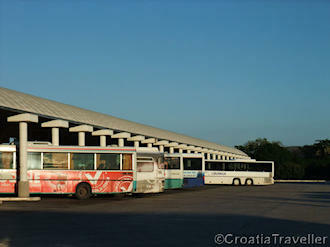 Croatia has an excellent bus system. Intercity buses are frequent, speedy and comfortable especially on the mainland. In fact, the bus system is far more extensive than Croatian railways. It's always faster to take a bus rather than a ferry from one coastal city to another. 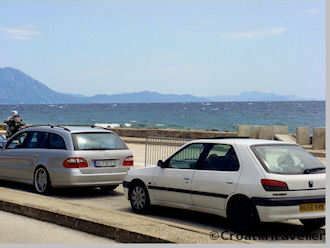 On Croatian islands however, bus service is somewhat less convenient particularly for reaching interior villages. I recommend taking passenger ferries to the islands and renting a car for a day or two of sightseeing. Some restaurants and nearly all private accommodation are cash only. Some pay-on-the-spot local ferries and all taxis and bus transport also require payment in kuna. Big hotels, ferry companies and car rental agencies take credit cards. You will find ATMs in every town, airport, ferry terminal and bus station. 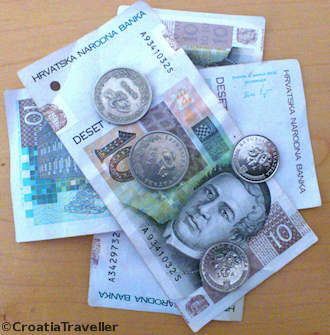 In a pinch, you can usually pay with euros if you happen to have it although the exchange rate is not as good as when you change money at a bank or withdraw it at an ATM. All kinds of things can happen on holiday from missed connections to lost luggage to health issues. Although Croatians couldn't be more helpful and the medical system is excellent, there's an added security in knowing that an independent operator can help sort out your troubles. I recommend World Nomads, an internationally recognized company with round-the-clock service and easy-to-understand policies. Croatia takes drunk driving seriously. You're allowed a glass of wine with dinner but penalties are severe for a blood alcohol level that exceeds 0.05%. In any event, you'll need your wits about you to deal with Croatian daredevils on the road. And, don't forget to put away your cellphone. Conversing or texting on the road is illegal. Pay attention to the speed limit. If you're stopped, the trooper may demand a cash fine on the spot. Most of Croatia's beaches are rocky or pebbly, not sandy. No more sand in the swimsuit! Good water shoes that you can swim in make all the difference. In addition to comfort, water shoes protect against the occasional sea urchin that may loiter near the water's edge. A cheery "Dobar dan" (Good day!) works wonders. Most Croatians are multi-lingual and there has been a heavy emphasis in Croatian schools on learning English. German is widely spoken in the interior and Italian on the coast but French speakers are rare everywhere. Consider learning a little Croatian or at least 10 useful phrases in Croatian. See more on the Croatian language. Renting a car is a major convenience. When booking online, most companies will try to sell you a "cross-border card" if you're driving to or through Bosnia-Hercegovina or Montenegro. Driving down the coast from Split to Dubrovnik takes you through a small slice of Bosnia at Neum. You do not need to purchase additional insurance for this route no matter what a rental agent may tell you as coverage is extended by law. Circumstances vary for a trip to Montenegro. More here.